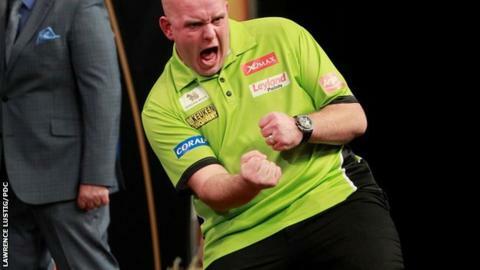 World number one Michael van Gerwen defeated six-time winner Phil Taylor 16-13 in the final to win the Grand Slam of Darts for the first time. The 26-year-old Dutchman added the Grand Slam title to his wins at the Masters, UK Open, World Matchplay and European Championship earlier in 2015. Stoke-on-Trent's Taylor, 55, led 7-3 but six successive legs from Van Gerwen turned the match in his favour. "To beat Phil in the final is a great honour for me," he said. "I had two main targets this year which were the World Matchplay and the Grand Slam of Darts and I've won them both." Taylor said: "I missed too many doubles and it's my own fault. I'm proud to have reached the final but I'm disappointed that I lost.